Make your own backyard, garden, and patio furniture out of salvaged pallets for an upcycled backyard made out of recycled materials. This collection of DIY Outdoor Pallet Projects makes it easy! I am absolutely amazed by the many things you can do with salvaged pallets. Quite a few creative people have figured out some pretty amazing ways to repurpose them. Today I’m sharing share some of my favorite DIY Outdoor Pallet Projects. Together they would make an awesome upcycled backyard! Related: Top 10 Sand and Water Tables Kids LOVE! These 15 DIY outdoor pallet projects are amazing. You can make so many cool things for the backyard, patio, and garden with salvaged pallets. The difficult part about all of the amazing pallet tutorials out there is that they are hard to find. Many creations that you see don’t link back to a tutorial, or the blog that created it. I have done my best to find projects from the source complete with step by step directions. Click on the creator of each project to see the complete directions with step by step tutorial. How do you know when a pallet is safe to use? Some salvaged pallets have been treated with chemicals you don’t want to handle or use as furniture. For tips that will help you find useable pallets hop over to read THIS article by DIY Projects. Pallet Compost Bin | Nemcsok Farms – This compost bin made of pallets is like the DIY pallet compost bin we made! How awesome would this DIY outdoor backyard pallet furniture look on your deck or patio? The pallet compost bin may not be pretty, but it sure is useful. We have one of these in our backyard with two bays. For information about how and what to compost click on the link. Many of these outdoor pallet projects are fantastic for families on a tight budget. Pallets are free! Building furniture and garden structures like raised beds can save you a lot of money. As you can see, there are so many amazing projects you can make for your backyard using salvaged pallets. 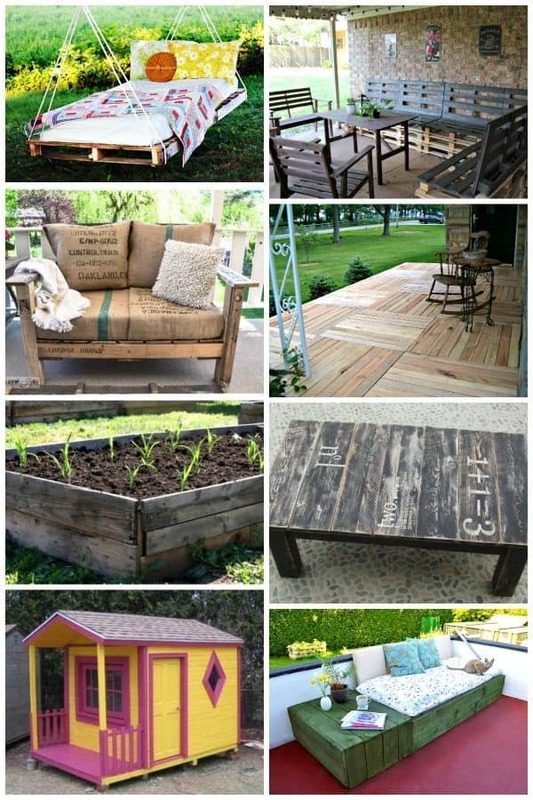 We hope you have fun upcycling pallets to make amazing things for your backyard! Don’t forget to check out DIY Projects for Do it Yourself Families! You’ve done it again, Miss Nell — this is a great bunch of ideas! So many creative ideas! I absolutely love the playhouse! I love them all too… and yes, the playhouse is fantastic! Wow! what ideas. 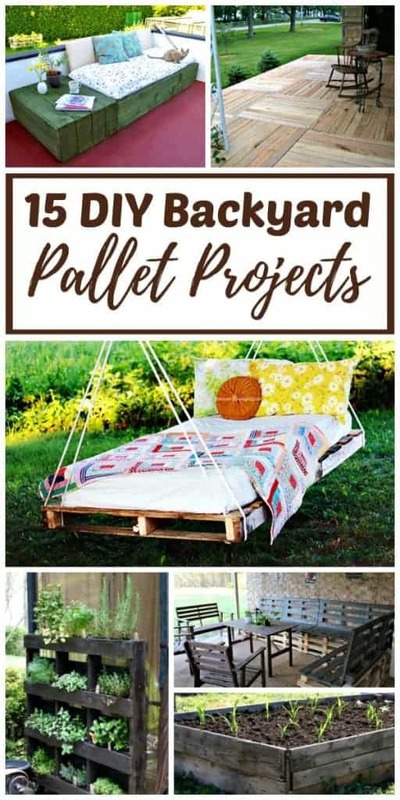 I like DIY pallet swing bed and DIY pallet playhouse ideas. I need it for my backyard. I think My kids like it. It will build memorable childhood for my kids. My favorite memories are of building and playing in spaces in our backyard. I hope your kids enjoy it! Amazing ideas. I just loved it specially pallet playhouse & Swing sets ideas. I think it will be great fun for my kids. I want to make like this playhouse for my kids backyard fun. Thanks for sharing. I’m so glad you like all of the pallet projects I have featured. I love this collection… the playhouse is divine!